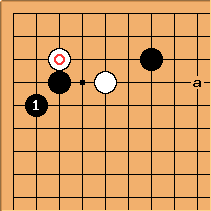 In a 1995 game against Yu Bin, Otake Hideo played the highly-unusual after the contact play . 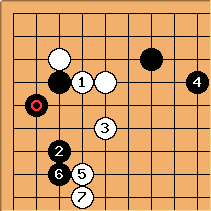 This is not joseki: Black was very strong on the upper side and wanted sente to play at a and complete his formation. This idea of the 'diagonal away' is unusual. 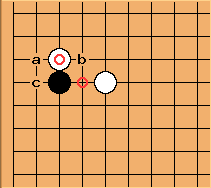 On general principles of shape, one expects Black at answer at a, b or c (the play at the marked point being bad shape). 4-5 point 4-3 approach ogeima, tenuki.